Hello from Chicago and the 2009 Midwest Clinic! It’s cold up here but, as always, it’s been a great and FUN experience and one that I truly value! The Annual Midwest Clinic is more than fun though, it is a multi-faceted experience, a chance to meet-up with old friends and colleagues, a chance to meet new people, a time to learn new things, make plans for the next year, and to experience some of the best music performances available from k-12 bands, universities, and the military. For me, Midwest has been a special part of my life since my first visit in 1993 as a junior in my undergraduate program. A little later in the week I am going to be posting some of my personal highlights from the conference this year -they were great! 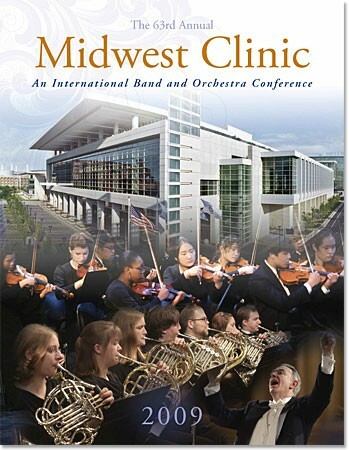 I know so many people that have told me that they’ve wanted to attend Midwest, they’ve been planning to go, or that they can never seem to get things to work out “right” to go… I believe that the Midwest clinic is such a transforming experience for any instrumental band director, especially middle-school through the university directors, that they should/NEED to find a way to attend this conference; at least, once in their lifetimes as active directors…then, do doubt, they will want to attend more frequently. Except for perhaps the Texas Bandmasters Association’s Convention, Midwest really has no equal in the U.S. In my mind, it is a “must attend” event -as often as possible. Start putting together your schedule and plan now! Now’s the time, make the time, make it happen next year! Stay tuned for my next post about some of my experiences at the Midwest clinic this year!